Thank you! I recently got a ukulele, and it’s great to know I can learn and play awesome songs! Any chance of having more Scorpions songs on this site? Scorpions are a heavy metal / hard rock band from Hannover, Germany, best known for their 1984 rock anthem "Rock You Like a Hurricane" and their singles "Wind of Change", "No One Like You", "Still Loving You", and "Send Me an Angel". The band has sold over 100 million records worldwide. 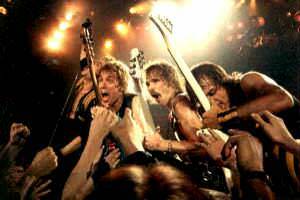 Along with Metallica, Iron Maiden, AC/DC, Kiss, Aerosmith, Ozzy Osbourne and Deep Purple they are one of the most successful hard rock/heavy metal acts and by far the most successful German Rock band in America and England. .